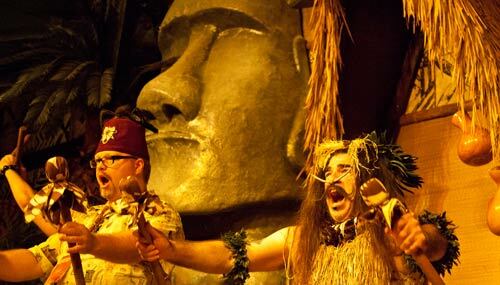 The Red Palms Chapter of the Fraternal Order of Moai recently sounded the conch to assemble the tiki faithful from September 30 to October 2 for a whirlwind tour of the best tiki locations in the Chicagoland area. The premise was simple: fun, cocktails and good works with event raffle proceeds earmarked for CatNap from the Heart, a local non-profit animal shelter. As the appointed date approached people answered the call and gathered at the Aloft hotel near Chicago's bustling O'Hare Airport. At check-in everyone received an event poster printed by Dean's Graphics and picked up their fabulous CATT tiki mugs from PopTiki of Colorado. Jet Sterling of Surfabilly Freakout radio opened the kick-off party and presented The Cocktail Preachers for a live performance while guests enjoyed cocktail specials at the bar. As with most F.O.M. events the cocktails were garnished with a fabulous custom event swizzle stick from Royer Corporation. Then it was time to turn the floor over to Java from Bachelor Pad Magazine for a live taping of the next episode of Bachelor Pad Radio which aired on WEFT in October. 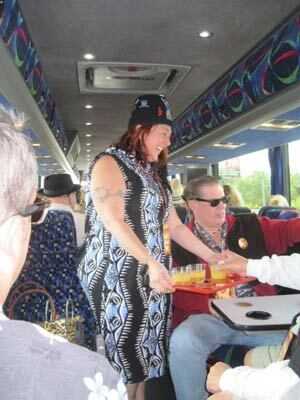 After a little sleep it was time to load up the buses and begin the tour. Two large buses arrived and half the group boarded Bus Awesome, hosted by Java, and the other half boarded the Tiki Transport 5000, hosted by Jet Sterling. Things started off quickly as everyone boarded with a swag bag and were served the first cocktail of the day by the hosts on board. Along the way raffle prizes were handed out using the playing card raffle made famous by the Northeast Tiki Tour. Prizes included a variety of items donated by friends of the tour and sponsors BambooLodge Vintage and Go! Tsunami. Then it was time to get off the bus for cocktails and appetizers at the Malahini Terrace. This location is, like the Pacific Islands themselves, a bit isolated and hard to get to for many people. But the CATT caravan arrived to enjoy one of the Chicago-area's most under appreciated tiki-themed restaurants. Malahini is Hawaiian for "newcomer", and in true island spirit, first-time visitors will be made to feel right at home among area natives! One notable thing about the visit was that due to local liquor laws cocktails could be ordered right away but could not be actually served until noon. With everyone's appetite whetted it was back on the bus for more raffle prizes, a round of cocktails and a short trip to Tong's Tiki Hut for a buffet lunch. And cocktails. Tong's Tiki Hut is the best reason to visit Villa Park, Illinois. Tikiphile visitors felt right at home at Tong's, enjoying Chinese-American cuisine among the bamboo, fishing nets, tikis, and a tropical mural. The arrival of the buses brought out the manager of the sporting goods store next store with the urgent news that the restaurant did not open until 3:00 p.m. But somehow the doors magically opened wide to accept the hungry horde of tikiphiles. After lunch everyone needed a break so it was off to the Hala Kahiki Lounge and Hawaiian South Sea's Shop for cocktails. Hala Kahiki, the jewel of Chicago-area tiki, is also among the best preserved classic-era tiki bars in the world. Witco enthusiasts marvel at one of the most concentrated assemblies of Witco decor anywhere, as they peruse an epic-length drink list. Opened in the late 1960s by Rose and Stanley Sacharski, Hala Kahiki is still operated by the same family. And then, with only a fresh cocktail on the bus to tide everyone over, it was time to head for dinner. The cocktail offerings on Bus Awesome and the Tiki Transport 5000 varied during the day between original offerings designed by the Red Palms Chapter featuring products from Koval Distillery like the Koval Lei and a choice between the Bermuda Sunset and the Ginger Collins personally served by Paul from Barritt's Bermuda Ginger Beer. 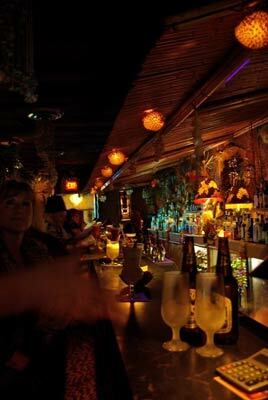 The Tiki Terrace was the last stop of the evening and CATTers found an amazing oasis hiding behind a small, unassuming entrance. 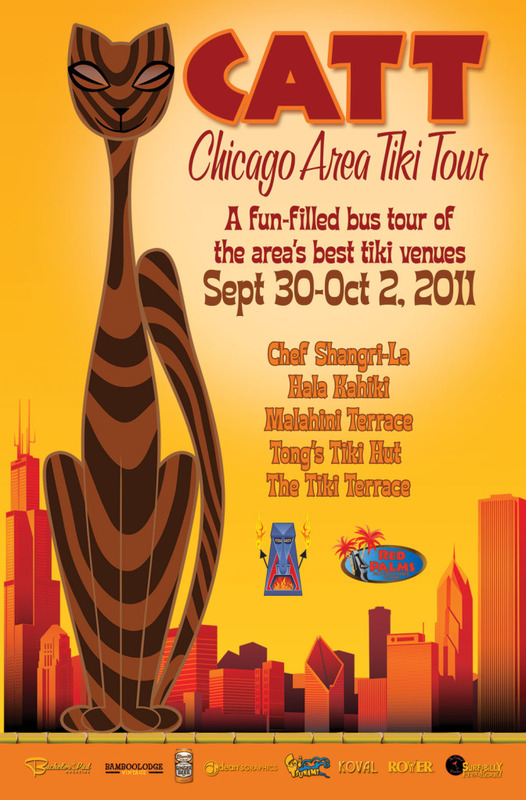 Tiki Terrace is where Chicago's Hawaiian community gathers. A labor of love brought to you by the brothers Zuziak, Tiki Terrace is the best place in the Midwest to see authentic islands entertainment while enjoying Hawaiian comfort food, such as loco moco. The incredible pan-Oceanic decor was mostly hand-fabricated by the Zuziaks, who are also performing fire-knife dancers. After a brief ride home to the Aloft it was time to call it a day and rest up for the Sunday after party at Chef Shangri-La. To get everyone up and moving in the morning the Red Palms Chapter offered up the most comprehensive self-serve Bloody Mary bar in history. Properly fortified the crowd set off to enjoy a lively lunch at the Chef with live entertainment by Alewife. The lure of the raffle items was great and more than a few people changed their flights to be able to stay and buy tickets for the most coveted items. But the real winner was CatNap for the Heart when the $1,250.00 in proceeds from the raffle were donated to the shelter. With Chicagoland tiki thoroughly explored it was time to say farewell and close the weekend.